The Ray-Ban New Wayfarer RB2132 flaunts a softer eye shape than the original and offers both classic and fashion bright color options. The proprionate frame Ray-Ban New Wayfarer RB2132 is lighter than acetate. Available in two sizes (52 and 55mm) and various frame/lens associations. Go back to where it all began with Ray-Ban New Wayfarer RB2132 sunglasses. Using the same iconic shape as the classic Ray-Ban Wayfarer, these sunglasses offer an updated version that includes a smaller frame and slightly softer eye shape. 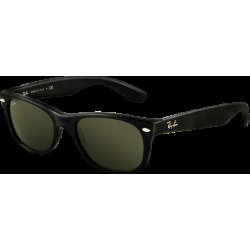 Choose classic black frames in a variety of lens treatments including crystal green, bi-gradient, G-15 polarized and mirror styles. All Ray-Ban New Wayfarer RB2132 sunglasses are designed to offer an easy fit with a high level of visual clarity and protection. A slightly smaller interpretation on the most famous style in sunwear. 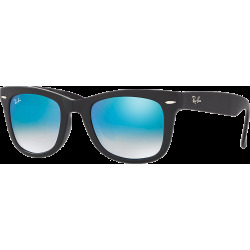 The iconic Ray-Ban New Wayfarer RB2132 is immediately recognizable anywhere in the world. This update adds a new level of playfulness to the iconic shape. The Ray-Ban signature logo is displayed on sculpted temples. The Ray-Ban New Wayfarer RB2132 flaunts a softer eye shape than the original and offers both classic and fashion bright color options. These sunglasses allow the wearer to enjoy a classic, celebrated style while adding their own individuality. A contemporary update of a timeless icon.